Like other altcoins, IOTA prices are moderately recovering. It’s not a banger as expected but still, after 2018 pain, any upward trajectory is welcomed. At the moment, IOTA is up 4.3 percent in the last 24 hours and after talks of Coordicide in the last days of December, IOTA is scaling up rolling out products and announcing new partnerships. Center stage is Chat.ixi, a new ad free, private chatting application that runs on the IOTA Controlled Agent (ICT). What’s special is that the app is not an information trawler. ICT is a light node, an experimental test net designed specifically to sate the needs of Internet of Things. The project is a brainchild of Samuel Rufinatscha and Lukas Tassanyi. Lukas is better known as MicroHash in IOTA forums. A Computer Science Graduate from the University of Dresden, Lukas was actively involved in the IOTA Spam Fund, an initiative tasked with spamming the IOTA network in a bid to speed up transaction processing. To reiterate, IOTA is making good progress against the USD. It is up 4.3 percent at the time of press and trading within a bullish breakout pattern after high volumes swings of Dec 20 bull bar—28 million against 12 million, took it above the 30 cents barrier. 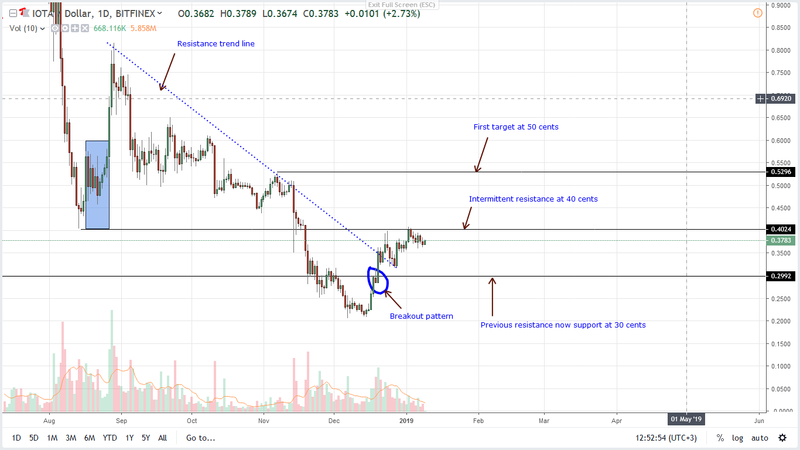 In a classic breakout pattern, traders were better place to load up at spot prices because consequent moves also propelled IOTA above the six-month resistance trend line meaning buyers were firmly in control. At the moment through, obstacles to upside are present at 40 cents and in an uptrend, aggressive traders can buy at current rates. However, a conservative approach is to wait for clean breaks above Q3 2018 lows at 40 cents. Because it will be a breakout pattern, accompanying volumes should be above current average of five million. Thereafter, first targets will be 52 cents or Nov 2018 highs with stops at 34 cents. Today, we are likely to see Litecoin (LTC) replace Stellar (XLM) as the sixth most valuable coin in the space. 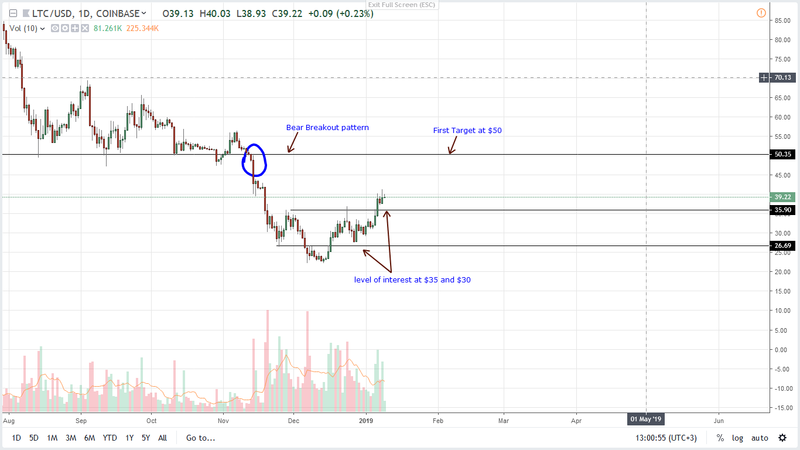 Not only is LTC performance exemplary but trading conditions as set out in previous trade plans have been met.